Unlike Thanksgiving, which puts the glistening, golden turkey at the center of its table, Christmas dinners have no such traditional fare. Oh, sure, it was a prized turkey that Scrooge sent the Cratchits' way once he'd been faced with his fate – a gifted gobbler to replace the family's goose, "its tenderness and flavor – the themes of universal admiration." A look back at history also reveals a host of other customary holiday foods, from fat-glistened rib roasts of beef to visions of sugar plums. Though these are meals that often get top billing as the new year approaches, grand cuts of venison have also entertained princes and paupers alike at Christmas since the first stag heard the hunter's horn. Here in the northern hemisphere, hunting seasons lead up to and often overlap the holidays. It's only natural for the animals killed to be honored in festive feasts when friends and family gather together to celebrate. Historically, even those unable to take part in the hunt dined on venison during the holidays as the lords of the manor gifted lesser cuts and offal to their servants who turned them into another traditional meal: mincemeat pie. Here in the states, that humble pie is not as common at Christmas anymore, cast off along with the notion that only royalty should own the game of the woods. Instead, the North American Wildlife Model and our tradition of public lands gives anyone of any means the ability to put a proper cut of venison at the centerpiece of a holiday spread. Like any protein, the key to taking it from ho-hum to holiday-worthy is in the presentation. Leave the burger in the freezer and go big instead. Think complete quarters roasted over the hearth. Long loins smoked and sliced at the table. Or, as the recipe here suggests, an elk tenderloin wrapped up in puff pastry just waiting to be opened like presents under the tree. To make the duxelles, sauté shallots and mushrooms in butter until the moisture from the mushrooms has evaporated. Add a splash of cream, along with dried thyme, kosher salt and black pepper. Stir until duxelles forms a tight paste. Transfer to a plate and let cool while you prepare the venison. Season elk tenderloin with salt and pepper. Heat one tablespoon of olive oil in a heavy cast-iron pan and sear tenderloin quickly on all sides. Spread a thin layer of English mustard on the tenderloin and transfer to the refrigerator to cool. Layer the prosciutto slices onto a large sheet of plastic wrap, then spread on the mushroom duxelles. Place the mustard-coated tenderloin in the center of the prosciutto-mushroom. Carefully lift one side of the plastic wrap, rolling the prosciutto over the tenderloin into a tight cylinder. Chill for 15-20 minutes. Whisk together the egg yolk and milk to make an egg wash. Place one sheet of puff pastry onto a large sheet of plastic wrap. Unwrap the tenderloin from the plastic and place on the center of the puff pastry. Fold one half of the pastry over the tenderloin, then roll into a cylinder, sealing it with a broad brush of the egg wash.
Line a baking sheet with parchment paper and place the pastry-wrapped tenderloin in the center of the sheet, seam side down. Brush the remaining egg wash over the pastry and cut small slits into the top to allow steam to escape. Bake 25 minutes, then check the internal temperature of the meat with a digital thermometer. Bake another 5-10 minutes, or until the temperature reaches 125 degrees. Remove the Wellington from the oven and let rest 10 minutes before slicing. for "Fillet of Beef, a la Wellington" appeared nearly 90 years later in a 1903 issue of the Los Angeles Times, though a more accurate description of "Larded tenderloin of beef. Roast very rare. Allow to cool and roll into pie crust." was printed in 1939, according to the Oxford English Dictionary. It's this version of the Wellington that we're replicating here, the piecrust giving way to puff pastry and an elk tenderloin a worthy and wild replacement for your basic beef. Any venison loin can be used here, and I'd challenge the brave to attempt a whole backstrap wrapped and roasted. If you're going that far, I'd even suggest making the pastry from scratch, though I see no real reason other than vanity for not using the premade version widely available in your grocer's freezer. 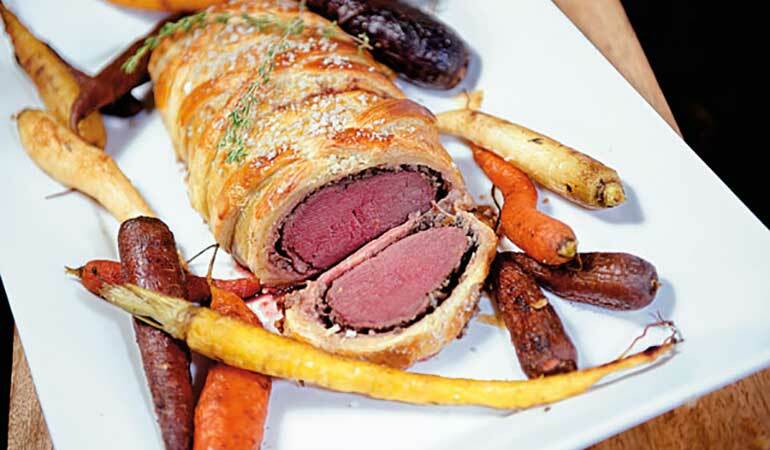 A wild-game Wellington is actually easier than it looks, though I wouldn't divulge this secret when your guests wow over the presentation. Just be sure your mushroom duxelles are in a proper paste as the pastry is prone to wet out if too much moisture is trapped within. I do like a strong English mustard, such as Colman's, for the bite it brings, and be sure to grace the inside with good prosciutto, which also helps seal the pastry off from the steam and keep everything from getting too soggy. An elk tenderloin, or any venison loin for that matter, still pink in the middle and presented in a golden, flaky crust is a bar above any prized turkey or cooked goose when unwrapped as the centerpiece of Christmas dinner. In fact, if Scrooge had been a hunter, he most certainly would have left that turkey hanging in the window and given Bob Cratchit some venison from his larder instead.